If you're hoping to get your hands on the Droid 2, the anticipated refresh of Motorola's popular Android-based device, you may not have much longer to wait. Motorola and Verizon recently published teaser ads announcing the Droid 2, device pricing appears to have leaked out thanks to Engadget, but there's still no official launch date. 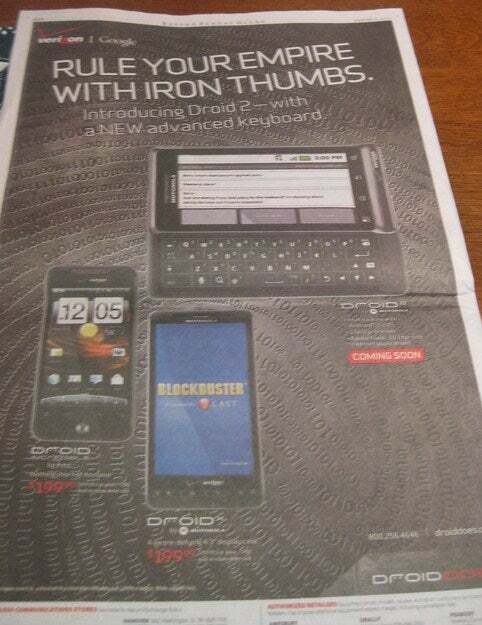 Over the weekend, ads showing off the Droid 2 appeared in newspapers across the U.S. (Click on the image for a closer look at this full-page ad.) The caption read, "Rule Your Empire with Iron Thumbs," and the ads were widely reported in Droid and Android-centric blogs such as Phandroid. But instead of specifying a launch date the ad simply states the device is "coming soon" to Verizon. The ad also listed a few specs for the device. As expected, the Droid 2 will be running Android 2.2 (Froyo) with Adobe Flash capability and be sporting a 1GHz processor. The Droid 2 is expected to launch on August 12, according to the latest rumors, which definitely qualifies as "coming soon." But if the Droid 2 is coming this Thursday, then why wouldn't Motorola and Verizon mention that important fact in advertising materials published just a few days prior to launch? Who knows? Maybe they don't want to spoil the surprise. It's also possible the Droid 2 launch is a little further out than current rumors suggest. Usually, when a popular device is no longer available for purchase online, and another product is set to take its place, the old device has been pulled due to an impending product launch. Nevertheless, at the time of this writing the original Droid was still being sold in some parts of the country, including Chicago and Miami. hotos of a Droid 2 display unit complete with pricing at a Best Buy location (click on the image to see the reference). The Droid 2 will reportedly set you back $199 with a two-year contract if you're a new customer or eligible for an upgrade. If you're willing to shell out full price for the handset, then you're probably looking at a cost of about $600. Since there's no official pricing announcement yet, Engadget's pricing is still just rumor. But considering $199 is the typical price point for a smartphone, it's a pretty good bet these prices are correct.